New loan signing Jermain Defoe gives Rangers the "luxury" of playing two up front, says manager Steven Gerrard. Rangers have largely played with just one striker this term - Alfredo Morelos leading the line and scoring 20 goals. But Gerrard says Defoe's arrival from Bournemouth for 18 months and the return of Ryan Hardie from Livingston gives him food for thought in attack. "It's so exciting to have the options because we haven't really had that," Gerrard told Rangers TV. "We've only really had one or two ways of playing and we've tended to stick with that." Striker Kyle Lafferty has made nine of his 17 league appearances for Rangers this season from the bench, scoring three times. Gerrard believes the Northern Irishman could also form a partnership with Defoe as "a target man and a smaller guy around him", adding he now has "four quality forwards" to work with. "When we use Jermain, if we use him with another forward, everyone else will maybe have to adapt and evolve," he said. Can Defoe & Davis make Rangers impact? Rangers have also signed Steven Davis on loan from Southampton until the end of the season, with his new manager confident he will slot straight into the midfield. "He'll take to it like a duck to water because he's the type of midfielder we like," Gerrard said. "He's very similar to a Scott Arfield in many ways in that he can play as a 10, he can play as an eight and he can play as a six." 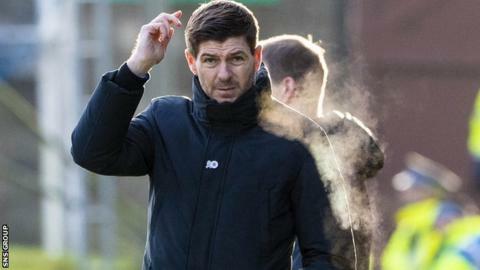 Rangers wrapped up their training camp in Tenerife on Sunday and return home to prepare for Friday's Scottish Cup fourth-round tie at League Two Cowdenbeath, before facing Kilmarnock in the Premiership on 23 January. Gerrard believes the winter break came at the "perfect" time for his squad after an arduous schedule of nine games in December. "We were running on empty and I think that showed in some of our results and performances," he added. "You look at the amount of games and the tiredness and mental fatigue, and maybe that was the case. "We gave the players a week off to have some family time and really recover. This week has been about building them back up and really pushing them physically again to get that base for the second half of the season."